In 1973, Jimmy Carter, then the governor of Georgia, filed a form with the NICAP to report a UFO sighting. 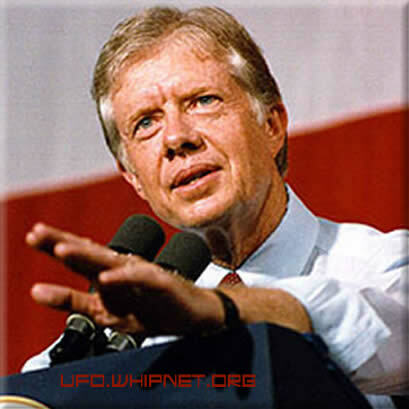 Carter said that if he became president, he would make every piece of information this country has about UFO sightings available to the public. But this was not to be. 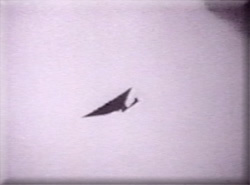 And one of the UFO incidents that the government continued to hold from the American people took place in Jasper, Colorado, in 1956, the subject of "The Top Secret UFO Project," filmmaker R. J. Thomas' parody of UFO documentaries. 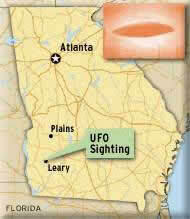 "Jimmy Carter was the first president ever to admit that he had seen a UFO," Mr. Thomas said. "Many applauded him for his bravery. He was taking a chance. A man preparing for a presidential bid is in no position to say things that make him sound like a crackpot." It was 1969, and Governor Carter was in Leary, Georgia, for a meeting with the Lion's Club. Shortly after dark, he saw a bright object in the sky that was a big as the moon and kept changing colors. After he filed his report in 1973, he said, "If I become president, I'll make every piece of information this country has about UFO sightings available to the public and the scientists." But after Carter took office in January of 1977, Walter Wurfel, the administration's Deputy Press Secretary, made it clear that this would not be the case. "There might be some aspects of some sightings that would have defense implications that possibly should be safe-guarded against immediate and full disclosure," Wurfel told the press. And one of the stories covered up was the Jasper UFO Incident. According to "The Top Secret UFO Project," in the summer of 1956, mysterious occurrences in Jasper forced President Eisenhower to prepare for a showdown with aliens, setting up huge military operations in the little Colorado town south of Denver. Based on Thomas' 2004 novella of the same name, "The Top Secret UFO Project" chronicles the UFO-related events experienced by this tiny Colorado hamlet. According to the film, the town dealt with one unusual event after another. After a farmer spotted a flying saucer zipping over his property, scientists rushed into Jasper to investigate, reporters rushed in looking for stories, and government officials rushed in to keep it a secret from the world. Billed as "the movie the government does not want you to see," "The Top Secret UFO Project," is a parody of the cheesy UFO documentaries of the 70's like "Overlords of the UFO" and TV programs like "In Search Of." Mr. Thomas plays a documentary filmmaker who, in 2003, discovered some top secret government films pertaining to the Jasper Incident of 1956. This inspired him to make a documentary about Jasper's UFO story, and to discover the truth behind what really happened that mysterious summer in Colorado. And as for the former president's sighting? "Carter looked at that UFO for at least ten minutes," Mr. Thomas said. "He really believes he saw a UFO. Not everybody agreed with him as far as his politics go, but I don't think anybody ever saw him as crazy. But, remember, MacArthur never saw a UFO, and he so firmly believed in them that he was ready to prepare for an invasion from Mars!"